The Google illustration the company foists on us seemingly every other day was an interestingly weird one this past Labor Day. It was an odd conglomeration of construction worker accouterments—a hard hat, work boots and gloves, and a construction cone—mixed in with materials used by tradesmen like electrical wire, pipe, and screws. Thrown in almost as an afterthought: a spatula and bowl of batter for the gals, and a pair of glasses, a book and a lab flask for the science and academic geeks. Oh, and a stethoscope. All in all, a very 1950s-6-year-old-Tonka-toy-loving-boy view of the world of work. Yeah, Google, let’s make America great again! The truth is, if the google minions tried to do a more up-to-date graphical representation of the labor market today, it would consist of computer screens, stacks of paper, operator headsets, nurse shoes, Walmart vests, McDonald’s caps, and an Amazon. Exciting enough to induce an ennui coma in the hardiest soul. We’ve spent countless hours as a community going over zoning codes to attract developers. (How is that working out? Despite new planning jargon, that endeavor suffers from the same inability to make real change. But that is another story.) Since I’ve been here, however, the conversations about what kinds of jobs we’d like to see created, if it ever comes up, seems limited to a few vague sentences spiced with a buzz word or two like “hi-tech” or “commercial office space,” ocassionally “maker’s space” or “business incubator”. So what can Beacon do to become a place that has a healthy amount of work for its citizens? Part of the answer may come from the past. 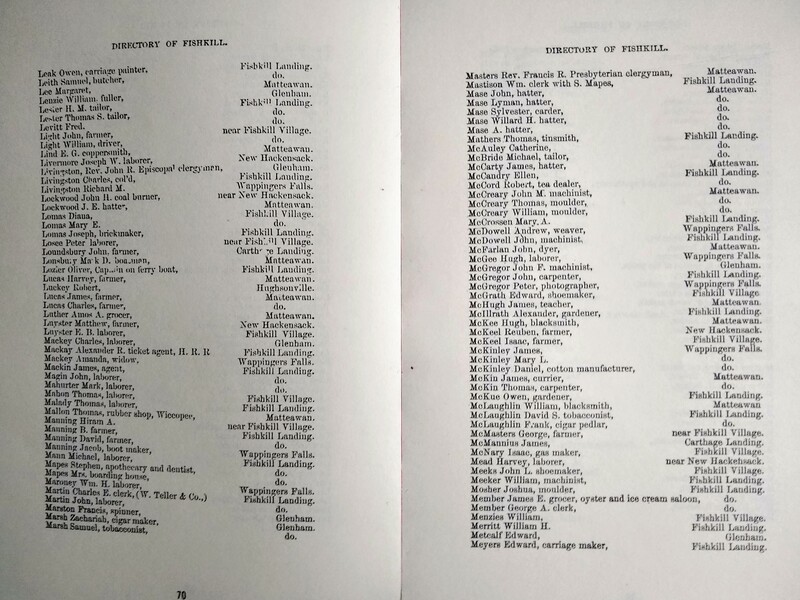 In her booklet Signal Fires On The Highlands, A History of Fishkill NY, 1683 – 1873, Fishkill historian Willa Skinner included the entire Fishkill directory of 1866, which lists people’s name, occupation, and location. 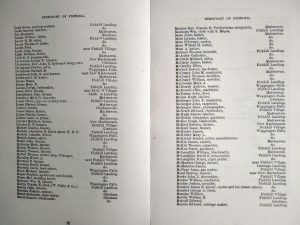 This directory was published less than 20 years before the first unofficial labor day marches in New York City, in the early 1880s. The vast majority of jobs involved manual labor of some kind: tinsmith, hatter, shoemaker, laborer, carpenter, moulder, wagon maker, farmer, butcher, laborer, machinist, painter, file grinder. The manual aspect is important, but maybe not for the reasons currently in vogue. It’s amazing that the majority of these labors were wiped out in this country within a century. We’ll take a closer look at Beacon and work in subsequent posts in this series. But next up is The Selection, Care, and Feeding of a Transportation Bicycle. Stay tuned!